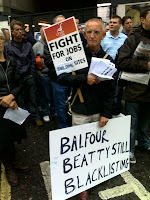 2012 Just another year of 'Blacklisting' workers? Don't you believe it! come into the public domain after being used as evidence in the court case. via an agency and not directly employed by the blacklisting firms. evidence about security services involvement. collapse - Victory to the sparks!! phone-in plus media coverage in the USA, Russia and Australia. inquiry with Home Secretary, Teresa May. House, Emcor, *Phoenix** *and the employment agency *Beaver Management. blacklisting at Prime Minister’s Questions. in written question to European Commission. though evidence only came to light once the blacklist files were released). Economic League in the 1980s. bullying endemic, systemic and deep-rooted in Carillion and other companies*"
strikers and Blacklist Support Group speak at official fringe meeting. industrial action, a public inquiry and Day of Action against blacklisting. Steve Kelly, Steve Acheson and Dave Smith speak at fringe meetings. National Shop Steward Network conference runs a workshop on blacklisting. for 14 years when he was an elected politician in Scotland. of a review of safety taking place in the European parliament. file compiled by the Consulting Association. Observer newspaper run major article with a Comment piece by Nick Cohen. Office to re-open its inquiry into blacklisting. Board of the Health & Safety Executive. Spanish press pick up blacklisting story. Beatty and Carillion as examples of continuing blacklisting. safety reps have been blacklisted. Financial Times run major story on blacklisting. 2006. Blacklist Support Group and GMB refute the claims. Blacklisting meeting takes place at STUC in Glasgow. worked on the Jubilee Line Extension. at the Liberty Awards ceremony. blacklister gives 4 hours of unrepentant evidence at the Select Committee. those senior managers that attended blacklisting meetings. blacklister having been named in previous Employment Tribunal judgements. UNITE demand an investigation into blacklisting on Crossrail. reps following request by Paul Kenny. Ian Kerr – chief executive of the Consulting Association dies. From Jerry Hicks: Re: Election for Unite General Secretary. Branch/Workplace nomination period 1st January to 15th February returned by 22nd February. Who would have imagined that Unite would be holding a ‘snap election’ for General Secretary so soon after the last one? Who would have guessed Len McCluskey would be seeking to ‘renew a mandate’ after only 2 years in office and with 3 more years still to go? So who did demand this “election”? Especially at a time when the union should be concentrating all its resources on fighting the cuts to services, pensions, jobs and attacks on members and their families’ livelihoods. hatever good Unite has done over the last 2 years has now been tainted, and what is happening is wrong. This election has been called on a flawed premise, it’s being fast tracked, it’s an election tailor made to suit one member above all others - 1.5 million others, and that far from ‘seeking to renew a mandate’ it is an affront to democracy. The speed at which this election is being rushed through gives little time for anyone to organise other than the existing GS, Mr McCluskey. Unless there is another candidate, Mr McCluskey will be “elected” unopposed, effectively extending his term of office without members actually voting until 2018 by which time he will be 67. Perhaps this is why the election was brought forward 3 years instead of 1 or 2 years. Unite supports the ‘68 is too late’ campaign. Do the maths. I support the campaign ‘68 is too late’ but so is 67. We should fight to reverse the raising of the retirement age. I say to call it an ‘election’ is being more than generous, as it bears all the hallmarks of an organisation seeking to avoid a challenge and thereby holding no election at all. Worse still by holding the election for GS in 2013 instead of 2015, the year of the UK General Election, Unite are throwing away a golden opportunity. We are told that a reason to bring forward Unite’s election is to avoid any clash with the UK General Election. But that is precisely when we would have maximum influence over the Labour Party. In one misjudged moment we are throwing away the greatest bargaining chip imaginable and the best possible chance to reverse the ‘one way’ relationship with New Labour and instead to negotiate a proper ‘quid pro quo’ agreement. McCluskey’s plan to reclaim the Labour Party has failed, proof being the recent Rotherham by-election, a Labour safe seat, the candidate chosen was not even a trade union activist let alone Unite’s choice, a Unite member and local workplace senior steward. Mr McCluskey talks about a co-ordinated fight against the assault on members’ pensions, jobs & conditions and of building a united campaign of resistance, and on that I agree. Yet when presented with an opportunity to do just that, Unite’s leadership chose instead to undermine the PCS and the NUT by not supporting the proposed co-ordinated strike action last March. That was a huge mistake. For there to be an ‘election’ there has to be more than one candidate. I have decided to stand in order that members do at least have a chance to vote and to present a positive alternative. However just to get the 50 nominations required to be on the ballot paper will be a big achievement in this most uneven contest. I have 6 million more reasons to stand. That is the number of £s of members’ money in the last 2 years alone that Unite has handed over to Labour with little or nothing in return. It’s about time that stopped. For Labour to expect support from Unite at the next General Election, Labour must first support Unite’s policies. :- Branch restructuring is chaotic but can be remedied: No member will be re-allocated to a Branch without their prior agreement. :- The election of all officials, elected by members, not appointed by an individual or a panel. :- Lead a fight to repeal the anti union laws UK & EU and when necessary to confront them. :- For a General Secretary to live the life of the members they represent, on an average member’s wage not a six figure salary. :- A Public Works programme, with the first jobs offered to blacklisted construction workers. :- The creation of one million ‘Green’ jobs. One million potential members. Support my campaign by nominating me at your designated Branch/ Workplace meeting. I will be relying upon the generosity of individuals, please consider making a donation. Cheques made payable to JerryHicks4GS & send to : 10 York Road, Montpelier, Bristol; BS6 5QE. When is an election for Unite General Secretary not an election? When there's only one candidate! But Unite leadership can think again as Jerry Hicks intends to stand. Who would have imagined that Unite would be holding a ‘snap election’ for General Secretary [GS] so soon after the last one? Who would have guessed that Len McCluskey would be seeking ‘a mandate’ after only 2 years in office and with 3 more years still to go? So who did demand this “election”? Was it the thousands of Branch Secretaries? No! Was it the hundreds of Unite committee chairs? No! So was it the tens of thousands of workplace representatives? No! As far as can be gathered, not one of these groups was calling for this “election”. Actually to call it an election is being more than generous, as it bears all the hallmarks of an organisation seeking to avoid a challenge and thereby holding no election at all. Indeed many in Unite believe that if Jerry Hicks, the rank and file candidate in the last  election for Unite’s GS and runner up with 52,527 votes, had not decided to stand there would be not be an election. Rushing through the election gives little time for anyone to organise other than the existing GS, Mr McCluskey. Unless there is a challenger, Mr McCluskey will be “elected” unopposed and is effectively extending his term of office until 2018 when he reaches 67, without members actually voting but allowing him and his supporters to claim it to be a mandate. Jerry Hicks believes that whatever Unite has done for the good over the last 2 years has now been tainted and that the election should not be happening, that it’s been called on a flawed premise and it’s being fast tracked. It’s an election tailor made to suit one member above all others - 1.5 million others, and that far from ‘seeking a mandate’ it is an affront to democracy. It also means by holding the election in 2013 that 1.5 million members are being denied an election for GS in 2015 when we would have maximum influence over the Labour Party as it would be during a general election year. Jerry Hicks said “I’ve decided to stand now the election process has begun in order that members do have a chance to vote and to present a positive alternative. However just to get the 50 nominations required to be on the ballot paper will be a big achievement in this most uneven contest. So what’s going on? If things in Unite are as good as Mr McCluskey and his supporters say, then why not just carry on doing these good things? And are we to believe that if no one from Unite’s huge number of officials puts themselves forward for the position of GS, it’s because they all agree with things as they are? One clue to an absence of challengers might be that, despite Mr McCluskey asserting that Unite is a ‘tolerant’ Union, there may be another story. Try asking those officials who left Unite in the weeks following the last Unite GS election, some felt obliged to leave the Union albeit with ‘pay offs’ possibly for nothing more than not backing the winner. For if any were guilty of wrong doing surely they should have been disciplined or dismissed, not paid off. Jerry Hicks said “Mr McCluskey talks about a co-ordinated fight against the assault on members’ pensions, jobs & conditions and of building a united campaign of resistance, and on that I agree. 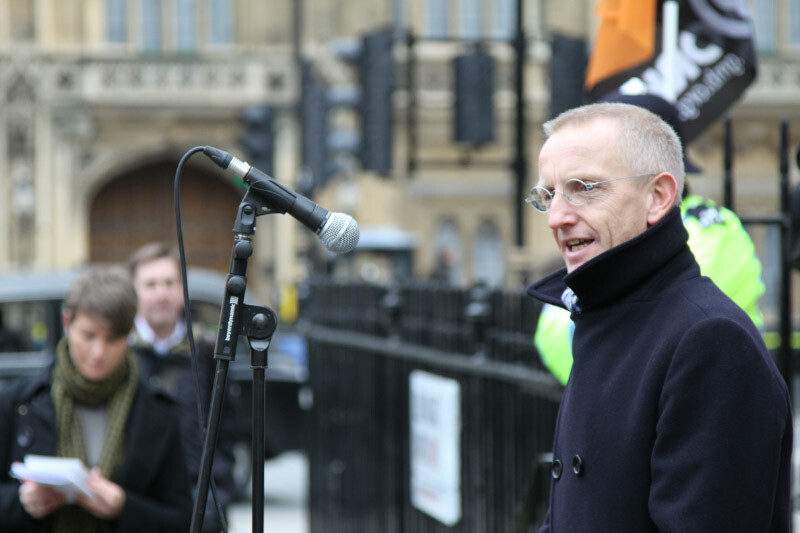 Yet when presented with an opportunity to do just that, Unite’s leadership chose instead to undermine the PCS and the NUT by not supporting the proposed co-ordinated strike action against the devastating attack on the pensions of Health workers, MOD & Government Departments and Local Authority workers last March. That was a huge mistake. But it’s not too late to start a serious campaign of opposition to the government cuts and attacks but it will take more than hot air at demonstrations”. Unite election for General Secretary 'Faster than a speeding bullet'. Faster than a speeding bullet! Is it a bird? It's a plane? Calling an early election is one thing and can be described [excused] in various ways, as indeed it is. Calling the election 3 years early and in the shortest period possible, which then gives absolute advantage to only one candidate, is another thing and surely can only be described as plain wrong. Commenting on this, Unite member Jerry hicks said “The super human efforts to hold an election for the General Secretary of the country’s biggest union in the fastest possible time is definitely not the act of superman”. Unite will come under more pressure to explain how it’s relationship with the Labour party works, if the latest reports are true. It seems that the Labour Party intends to abstain in next Tuesday’s [11th Dec] Public pensions Bill vote, reports the London Evening Standard. A very Senior Unite official is being quoted as saying that it’s a “strategic abstention”? Unite in the last 2 years alone has handed over £6 million of it’s members money to Labour, as well as the £10m’s over the years. According to Jerry Hicks it’s about time that stopped. He argues that a novel method of ‘payment by results’ would offer much better value for money for Unite members. He added that in his view Unite should only fund those MP’s that support Unites policies. If Labour expects support from public sector workers at the next general election, it should be leading the parliamentary opposition and voting against the Bill. Jerry Hicks was runner up to Len McCluskey in the last election for Unite General Secretary in 2010 securing 52,527 votes. Unite are throwing away a ‘golden opportunity’ by deciding to hold the election for General Secretary in 2013 instead of 2015 the year of the UK General election. The decision made by Unite’s National Executive Committee [NEC] 4th December, by 49 votes to 19, to call an election for the General Secretary a full 3 years early, on a recommendation from the union’s leadership, is unprecedented and is something that may come back to haunt them. Another twist in the aim to rush through the election at break neck speed, is the likelihood of there being very few candidates, perhaps as few as one? And perhaps that’s part of the plan? The ‘snap election’ could mean branch and workplace nominations as early as January and February with a postal ballot of over one million members in March 2013. This would give precious little time for anyone other than, shall we say, the existing General Secretary to organise a campaign. Indeed the dragging forward of the date may debar a senior official who would have been eligible by 2015 from standing because of the 10 year continuous membership requirement. Hence perhaps one of the unsaid reasons the election is 3 years early rather than say 1 or 2. A consequence of the decision, be it by design or ill judgement, is to deny members a decent campaigning time for discussion and debate and therefore less democracy because of the very short election period. Also had it been held in 2015 members would have a more valid time frame upon which to make a judgement on McCluskey’s leadership. Whatever the official reasons, one being stated is “to avoid any ‘clash’ with the UK general election” [full NEC statement on www.unitetheunion.org]. Jerry Hicks said “Remarkably it’s this ‘clash’ of dates that is being proffered by Unite’s leadership as something to ‘avoid’, but I say that in one misjudged moment we are throwing away the greatest bargaining chip imaginable”. The timing represented the best possible chance to reverse the ‘one way’ relationship with New Labour and instead to negotiate proper ‘quid pro quo’ agreement in exchange for our cash, time and resources. Members have seen £6 million of our money in the last 2 years thrown at the Labour party with little or no return”. The Con-Dem Government Chancellor George Osborne’s policies of cuts and austerity has spectacularly failed and so has McCluskey’s plan to reclaim the Labour Party. McCluskey pledged recently [Sept 30th 2012] to “kick the New Labour cuckoos out of our nest”. Yet weeks after this ‘fine talk’, far from Cuckoos being kicked out, Unite’s ‘chickens had come home to roost’ when in the Rotherham byelection, a Labour safe seat, the candidate chosen was not a trade union activist, let alone the choice of Unite which was a very well known local Senior workplace rep who wasn’t even short listed. McCluskey and Osborne are 2 years into their cleverly worked out strategies - both plans lay in ruins but both proponents trumpet the mantra ‘more of the same’. Jerry Hicks also argues: Whatever Unite have done for the good over the last 2 years has now been tainted by this pursuit of extension of office. It is without proper reason and will be costly. It comes at a time when the union should be concentrating all its resources on fighting the cuts to services, pensions, jobs and attacks on members and their families livelihoods. Unite make plans to call a snap election for General Secretary. But why? Unite make plans to call snap election for General Secretary. But why? The time table of this ‘snap’ election could begin as early as next week. It is expected that at Tuesday’s [4th December] National Executive meeting approval will be sought to begin the process of the election. The machinery can commence to issue notice to the membership, with the branch and workplace nomination period likely to be January and February. The postal ballot of over one million members could begin as early as the middle of March 2013. Len McCluskey became General Secretary of Unite as recently as November 2010 meaning that he has so far only served 2 years of his 5 years term of office. During McCluskey’s election just 2 years ago it was generally regarded that he would be a one term [5 years] General Secretary, neither he nor his supporters did anything to dispel the illusion. So why is this happening 3 years early? After all McCluskey could stand again in 2015 as a matter of course. However if he did and won a further 5 years in office that would take him to the age of 70 and advisors think that the union’s members would not be too happy to have a General Secretary working past normal retirement age. So by dragging the election forward he could run, win, serve a new term of 5 years taking him to 67, thus avoiding that and a number of other issues. Namely the Government proposals of retirement age of 68. Add all this to the biggest ‘plus’ for McCluskey and his followers, that by using all the union’s machinery to push through at ‘break neck speed’ an election 3 years early makes it almost impossible for anyone else to have anywhere near an equal chance as McCluskey, given the incredibly short time scale and the cost of simply mailing branches which runs to thousands of pounds. Thereby virtually ensuring him a smooth ride, maybe even unopposed. McCluskey seeking another term makes a mockery of the merger rumours between Unite and the PCS with Mark Sewotka taking over from McCluskey, rumours spread by both hierarchies. It would also cheat the membership out of an election in 2015 when it’s also the year for the next Parliamentary General Election. Unites ‘one way’ relationship with New Labour is an increasing source of criticism of his leadership, so in a General Election year a debate about it might be a problem for McCluskey. Jerry Hicks went on to say “This is just not right, it’s completely unnecessary and verging on abuse of power. It sets the wrong example, shows the wrong leadership and sends the wrong message that raising the retirement age is OK. It’s not! We should be seeking to lower the retirement age for working people, to end the scourge of high unemployment especially amongst the under 25s.